This is going to be fairly complex... and long... but the gist is that our search is now far more complex and powerful than anything we've had before, and as the saying goes, "With great power comes great confusion.". We used to have an "advanced search" on vBulletin. But that was pretty much a lie, there was nothing advanced about it. If you searched for "bottom brackets" then it wouldn't find you a "bottom bracket" (no plural)... but it would comfort you by giving you a few options... via 5 different search forms (one for profiles, one for posts and threads, one for "in this thread", one for PMs from/to someone, one for things in PMs). On Microcosm there is only one search form. One search form to bring them all and in the darkness bind them. Something like that, and this is the guide to search. Our search is like Gmail search, or Google search. One form, in which you put your search query. If you want to filter, or sort things... you type in key:value pairs to do whatever you want. Every key:value pair can also be a querystring... so you can bookmark this stuff (again... vBulletin couldn't do this very well). Cool... that's the basic stuff: You can search for text. Now the more complex stuff... you can add key:value pairs to the search and either find stuff that matches that type, or if you've provided some query you filter by that type. The first is going to find all conversations, and the latter is only going to find conversations that feature the words "car appreciation". You can specify more than one type at a time. Great... all events and conversations that contain the words ice cream. But... WTF? Comments too? Unless you tell the system otherwise, it's currently searching comments that belong to conversations and events, in addition to the conversations and events. We might be interested in that, but we may not... we can restrict the keywords to just the title. Wonderful! Sweet sweet ice cream found. But what if there are a lot of results and you want the most recent on top? Now it's sorted by date, the most recently modified item is at the top. Great so now they're sorted using sort:date, but another angle... let's get those comments back (by removing the inTitle:true) and just find the comments that @Howard has made about ice cream. He loves ice cream. Now we have every comment, by @Howard on about ice cream, in every conversation or event that he's mentioned ice cream, sorted by the most recent date. Or you might be interested in Bob Jackson's for sale, so it makes sense to restrict the search for Bob Jackson's to the titles of things in the Complete Bikes and Frames forum and to sort them by date (most recently modified is always first). That's a load of bikes. But maybe we only really want adverts in the last year as those are the only ones you're likely to get a lead on? The since value is the number of days in the past... so 365 gives us a year. But we can play with that... maybe we want to use search to get a "Today" view of the forum? That's every conversation, event, profile and private message that you're allowed to see that has been modified in the past 1 day... i.e. today. Note that searches only show you what you're allowed to see, so you can search for private messages and will only ever see the ones you're allowed to see. What have I missed? Search within conversation! Which now finds all comments that contain the word "sweet" within conversations that have the id of 253146 and in which the comments are authored by 47686 (me). inTitle: true = only search for search words within the title. This makes no sense if you aren't using search words. has:attachment: Will only show comments that have attachments. Regarding the option to search posts made by particular users, like the ability to mention somebody in a comment , prefacing it with an @ bringing up a list of users. Could this be possible within the search bar? I'm concious that searching for the user first, to establish their AuthorID, would be a ball-ache to do. Right now I'm focusing on the engine itself to make sure it can do stuff. High on the list is making sure I can power a "Today" page. Then I need to fix the broken search page as searching within resultsets risks losing some of your search query right now. But after all other things... I'll definitely get around to adding polish so that you can just @ people in the search box. Nice. Cheers for the How-to. Or did you mean ignore? We haven't built that yet. Ignore will be extremely effective when it arrives. Ignore will be extremely effective when it arrives. I am liking the sound of this. If you want to live good and prosper on the beautiful microcosm concept, retards and average joe may not fancy your search input code system. I think I can see the potential power of this search engine, but most people will not remember how to enter advanced searches. Average people probably would like boxes to put words into. So boxes for date, conversation, event along with the main search. I showed your post to my other half who reacted that it was too complicated and not at all intuitive. 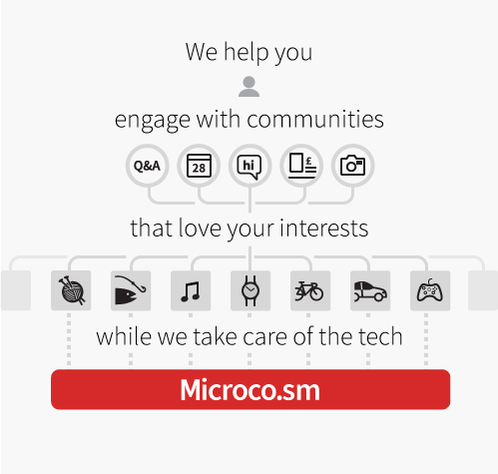 Users should not have to learn how to search or use microcosm, it has to feel intuitive rather than give the impression you need specialist knowledge or skills to participate. This is awesome for developers and power users. For normal humans who spend their time outside talking to other normal humans and doing normal human things instead of sitting in darkened basements learning all the shortcuts, it's less so. I really hope that this will be the case, because as it is right now it is dizzyingly complex. And I'm saying this as a developer. Only a very small number of people are going to read that explanation of "how to search", the rest of them are going to be constantly going "how do I search?" and then "I don't have time for this". Of those that do read it and take it in, they're going to have to think about how to do something that should be automatic, which is in flagrant breach of Krug's First and Second Laws of Usability. But obvs it's a work in progress and I'm looking forward to seeing your solution. Clearly not, but how, intuitively, can you (you, personally) now search a specific thread for a specific term? The answer, right now, is that you can't. You need to learn all that stuff in the OP to be able to achieve that, or you can get used to never being able to use search in that way. This is why I'm hoping Velocio's hint that "this will be easier" does actually work out that way. If it doesn't, then you'll be shut out of being able to do some pretty basic things because you lack the ability to speak the Shibboleth. True though I do speak fluent שִׁבֳּלִים (Shibboleth) -Lovecaftian term no? In time, it would be cool to see some kind of natural language veneer over this. "Bottom bracket in conversations that were started by howard in the last week in the members forum"
No, biblical. Book of Judges. Tut. Love the idea of that, that'd be very nice. Lovecraft is suddenly getting a lot of rep around here. Much power, much confusion. Dizzyingly complex. "Code", if that is what it's called, is not a language the average user of a microcosm forum should be expected to learn in order to find their favourite threads quickly, imho. I'm with the moaners, but optimistic with it. I enjoyed the fact that people could get to a point where they wanted to search something really specific, and would have to do a really specific search to find this thread to find out how to do the really specific search. Jesus. Just give me some check boxes I can mark off with my search criterias.